It's not often you get to experience the inception of artistic creation. 'Soul's Path' is just that. An inaugural collaboration between Matrafisc Dance Company, recently birthed by bold Italian dance artist, Ina Colizza, and married with live-music from Manchester's own Vonnegut Collective, a four-piece of talented musicians working to make their mark on the city. This is a brand-new piece of performance art by Manchester's brand-new dance company, intimately performed at The Wonder Inn, in the shadow of Shudehill Station. Matrafisc's first ever performance is site specific, meaning it has been created in response to the space it's in. The piece travels through rooms full of individual character, whilst the stories within gradually grow deeper and deeper. You're sure to have something in common with what you see; stories of friendship, love, fraternal bond and sexuality. It may even stir memories inside yourself that are mirrored by each movement taken. So this is your journey too and it starts the moment you step inside. The lucid choreography is born from Colizza's inquisitive interest in life stories and what makes us human. 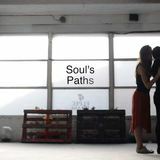 In fact, 'Soul's Paths' is a metaphor for our society; how we can all be too busy to enjoy the little things in life, with the instrumental music and dance aiming to reflect life's many complexities. One could argue choosing to go and see 'Soul's Paths' would be acknowledging the need to give up time to 'enjoy the little things' - another incentive to go. If you manage to snag one of the 60 limited tickets, get ready to follow the 'pied-piper' violinist around a charming building, moving from room to room seeing different parts of a collective story unfold. Starting downstairs you will be greeted immediately with a female duet. Beginning with a light-hearted scene basking in fun & recreational drinking, it soon moves onto a love story. After following the violinist upstairs, the tone gets darker as Ina examines the story of her own brother's problems with bipolar disorder and then onto a separate solo about the hardships of dealing with your own sexuality. Finally, all the stories, musicians and 6 characters come together bringing the emotional heartbeat of the performance to an inclusive close you won't want to miss. And just like that, a new dance company is born. Follow the path to something new and explore, in depth, the challenges that we all share. Visit this website to book tickets for the 7pm performance or the 9pm performance on Friday 28th October. , Paula de la Puente. , Harry Percy, Norm Skipp.